Susan Elizabeth Allen died on Sept. 7, 2015, at Evergreen Hospice Center in Kirkland, WA, of cancer. Susie was born on May 10, 1951 in Monrovia, CA to George H. and Dorothy (Wheeler) Allen. The family moved to Santa Barbara in 1952, where Susie attended Montecito Union, Santa Barbara Jr. High, Santa Barbara High and Laguna Blanca School. She found her life’s passion at the age of 12 when she discovered the harp, and spent the rest of her life as an artist, composer, teacher and author. Susie studied and performed locally at The Music Academy of the West, and with the Santa Barbara Youth Theater. After high school, Susie attended the New England Conservatory of Music and California Institute of the Arts, where she receieved a BFA in Music Performance in 1973. 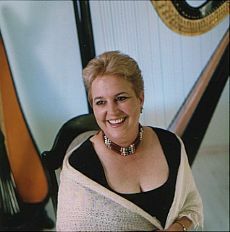 Susie spent her career championing new and contemporary music for the harp, with countless performances, master classes and seminars around the world. She has given solo concerts at Carnegie Recital Hall, Lincoln Center for the Arts and the Smithsonian Institute, and appeared, recorded and toured with artists such as Philip Glass, Pierre Boulez, John Cage, L. Subramanium, and Roman Stoyler. Her most recent solo album was released last April, titled “Postcard from Heaven”. In 1983, she returned to California Institute of the Arts as a faculty member, and served for a number of years as Associate Dean for Academic Affairs until her retirement earlier this year. As a child, a psychologist once said Susie was perfectly normal, but had a rather “bizarre” sense of humor. Bizzare, maybe, but definitely dry and witty, and even to the end of her life always ready with a zing or two for whoever happened to be around. Shortly before she died, Susie moved to the Seattle, WA area to be closer to her family. The family wishes to thank the staff at Evergreen Hospice Center of Kirkland, WA for their excellent care and compassion. She will be deeply missed by her family, all of her friends and students around the world and by her beloved dog, Renard. She is survived by her mother, Dorothy W. Angwin (Jeffrey), sister Wendy, and brothers Bill (Ruth), Tony and Brooks, and niece and nephew, Guinevere and Ben. A private service will be held at a later date.